Unprecedented melting of glaciers ! As ~ 1850 was the glacial maximum of the Little Ice Age, glaciers should still be receding at ever-increasing speed. During the Little Ice Age (LIA), alpine glaciers around the world reached their maximum Holocene extents, generally dating back to about 1500 AD. There followed several periods of cooling and warming when repeatedly glaciers expanded and retreated. Glaciers during the cool period of 1880 to 1915 reached almost to their LIA maxima, retreated during the 1915 to 1945 warm period, expanded again during the 1945-1977 cool period, and retreated during the 1978 to 2000 warm period. The Advance of Hubbard Glacier. Since measurements began in 1895, Alaska’s Hubbard Glacier has been thickening and steadily advancing into Disenchantment Bay. The advance runs counter to so many thinning and retreating glaciers nearby in Alaska and around the world. More details here. 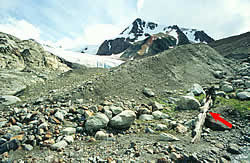 Ancient stumps and logs have also been popping out from under southern Alaska’s Mendenhall Glacier. 4,000 year old trees appearing from Swiss glaciers. That tells us it was at least 2~4 °C warmer when the forest grew & before the glaciers started, also that glaciers surge naturally…without mans intervention.